Ok people. Let me tell you that this post is almost not about Excel. It is about how one Excel blogger’s (yours truly) dream of long distance cycling came true. So sit back, grab your favorite drink and read between sips. 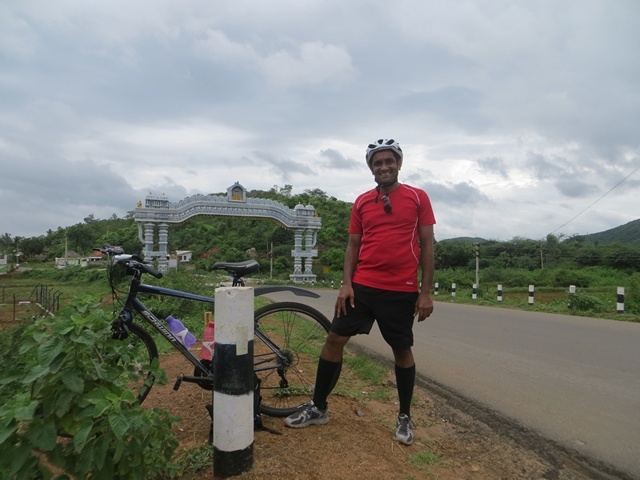 Last Sunday (27th July) & Monday (28th), I finished my first ever 200KM bicycle ride. I rode for a little more than 12 hours, burned 5,179 calories & rode 206 kilometers. It is definitely one of the most memorable, tiresome & uplifting experiences in my life. So naturally, I want to share the story with you. One of the popular uses of Excel is to maintain a list of events, appointments or other calendar related stuff. 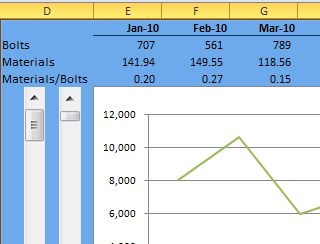 While Excel shines easily when you want to log this data, it has no quick way to visualize this information. But we can use little creativity, conditional formatting, few formulas & 3 lines of VBA code to create a slick, interactive calendar in Excel. Today, lets understand how to do this. 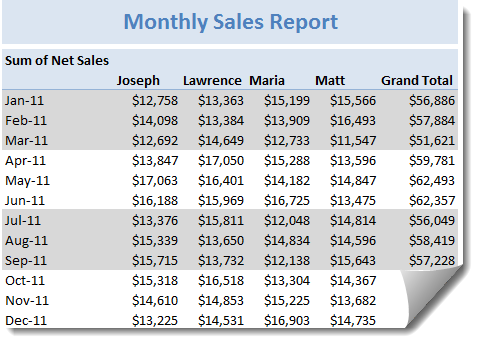 Here is a quick pivot table tip. When reporting summaries by month, it would be better to highlight 3 months at a time (Jan, Feb, Mar in one color, Apr, May, Jun in another color) than showing all in one color. Today, lets learn how to do this in easiest possible way. 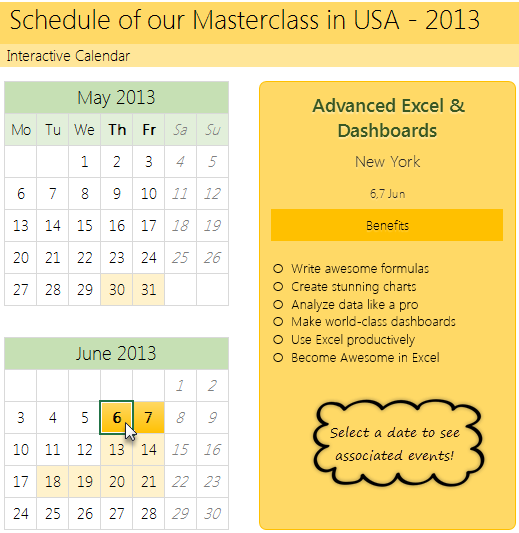 Interactive Pivot Table Calendar & Chart in Excel! During London 2012 Olympics, Usain Bolt reached the 100mts finish line faster than anyone in just 9.63 seconds. Most of us would be still reading this paragraph before Mr. Bolt finished the race. To put this in perspective, NY Times created a highly entertaining interactive visualization. Go ahead and check it out. I am sure you will love it. So I wanted to create something similar in Excel. And here is what I came up with. It has been a while since we had an Excel Links post. So here we are. First, I want to update you about our Singapore Workshop. As you know, we have opened the registrations for this workshop last week. If you are in Singapore and want to attend an Excel & Financial Modeling Workshop, Please consider joining us on July 8- 10. For details & enrollment, visit Singapore Bootcamp page. Apart from the Singapore workshop, I was busy last week conducting live training at CapGemini, in their Hyderabad office on Excel & Dashboards. It was a very good experience. I learned a lot about practical challenges people face when doing sales reports etc. using Excel. Yesterday, we have seen a beautiful example of how showing details (like distribution) on-demand can increase the effectiveness of your reports. Today, we will learn how to do the same in Excel. I have an exciting news & massive post for you. Chandoo.org reaches 20,156 RSS Subscriber mark on Jan 19, 2011As of Jan 19, 2011, our little blog has registered our 20,000th RSS Subscriber. While this is not a huge achievement or anything, It certainly calls for celebration. 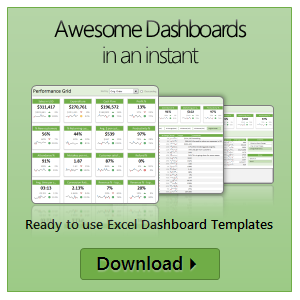 I am so happy to see our mission to make people awesome in Excel is reaching out to more people everyday. Thank you. 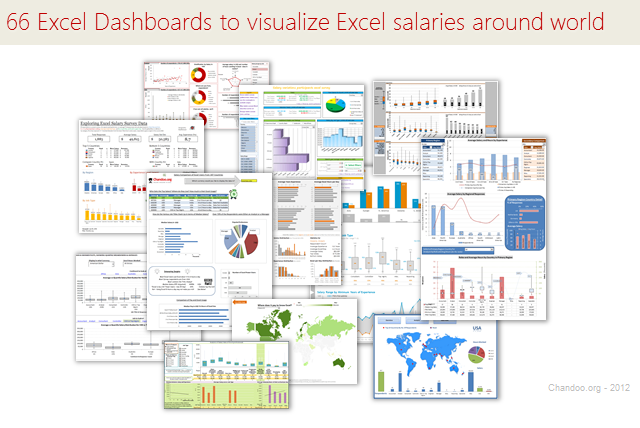 To celebrate this milestone, I am doing a massive post with 220 Excel tips, tricks, tutorials & templates. Once you start using Excel to develop systems, budget, forecast and large tables of data you may come across the dilemma of “How do I know this is right” or “How do I truth check this”. This post will add a tool to your arsenal to help you out. Ok, since excel school 3rd batch is going to open on 15th, I wasnt going to write anything today. I have slept just 4 hours last night, blame it on work (and that funny video on youtube). But I found 30 minutes free time, so here you go, a quick but delicious tip on making your data validation dynamic. Dynamic Data Validation?!? What in the name of slice bread and peanut butter is that? See the demo aside to understand and read on to master the trick. 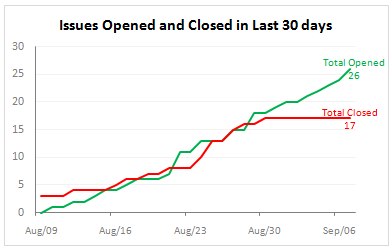 Tracking issues and risks is where most of the project management time goes. Once the project planning and organizing activities are in good shape, most of the project management activities are around risk management and issue tracking. In this installment of project management using excel, we will learn how to create a simple issue tracker template using excel and how to analyze issues using excel.